mark's latest cheek color is a budget friendly treat that's not only pretty in the pan but gorgeous on the skin! 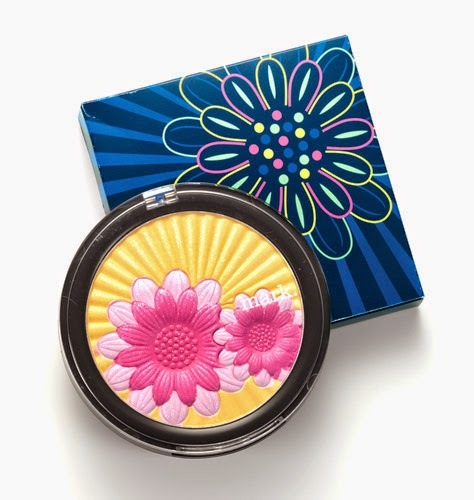 I found this mark Blooming Pretty Highlighting Face Powder to be versatile in addition to super cute. I could use the yellow background color simply as a highlighter (which is much softer and sheerer on the skin than it looks in the pan), or I could combine the two pink shades together as a blush, or just use the deeper pink flower shade as a blush. The best part is, if you choose to swirl all three shades together, the result is the prettiest, most flattering rose/gold glow. The blend of all three shades will work well with most skin tones as well. The shimmer in the powder is not overwhelming or very obvious, so this works for day and night. All the colors wore very well and lasted at least 6+ hours before showing any signs of fading. Tip: The powder's texture is soft with medium pigmentation, but it's not extremely silky, so you'll need a denser brush in order to really pick up the color in this palette.